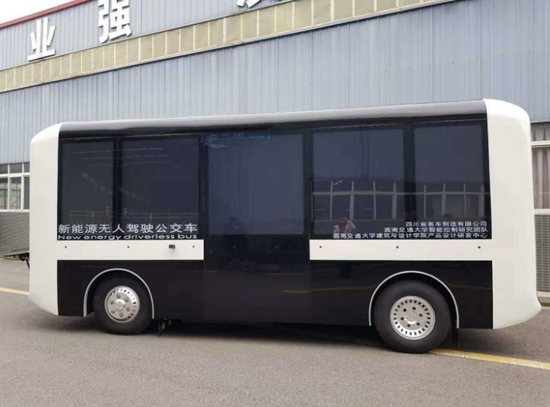 A 14-seater new energy, unmanned bus struts its way just outside the headquarters of Sichuan Bus Manufacturing Co., Ltd – the manufacturer of the vehicle – in suburban Chengdu. According to Zhang Jiaqi, chief engineer at Emei Bus Research Institute (part of the bus manufacturer), this driverless vehicle is the first of this scale in Sichuan Province and in China's entire western region. "It's currently still in [the] testing stage. We first aim for the bus to operate within fixed routes, closed parks and scenic spots. In about two to three years, hopefully it can be fully applied to the city's public transport system," Zhang said. The unmanned bus is 5.9 meters long, 2.1 meters wide and 2.7 meters high. It has a test speed of 20 kilometers per hour. Zou Yingquan, associate professor of the Intelligent Research Team at Southwest Jiaotong University, said the most challenging part is the system's ability to cope with complex road conditions and emergencies. "For example, breaking into pedestrians or animals coming from the side. The other challenge is when there is water on the road or obstacles such as well covers," added Zou, who is in charge of the intelligent control system of the unmanned bus. But Zou insists that this is more of an experiential journey for the public, which will encourage experts to discover and produce new driverless technologies in the process. When it comes to the driverless bus technology used, Zou cited China's Beidou system for accurate positioning – to the centimeter level. Meanwhile, he said the vehicle's brake and steering control system is independently developed. The unmanned bus is designed by the School of Architecture & Design of Southwest Jiaotong University. The school's R&D professor, Huang Tao, said the idea initially came about to develop transportation with sustainable development in the city. "Public transport, new energy, automated intelligence. We hope these advantages will be reflected in our unmanned bus," Huang said.